Bear. commented yesterday: "GAS is merely a symptom of GUNNA. One day, I'm gunna do it. Really, who regularly shoots at 18 or 20 FPS? Or regularly prints 30 x 40 inches and needs FF 42 MP, or even MF 50–100 MP resolution? Sure, some do. But for most, it's because they're gunna use it—one day—which they don't. GUNNA does not arise for pros because their gear acquisition is driven by the necessity to make profit, not discretionary spending." Mike replies: I used to suggest, in the old days, that people sit down and write out a clean-sheet list of the features they want and what level of performance they think is sufficient. Then, they have that list to compare actual cameras to. The list should include "ideal" size and weight parameters so we can consider how close a camera comes to what we prefer, and also what lenses it has to have available for it. Over the years my own list has been subject to "inflation." For instance, in the 1980s, I thought I needed 2 FPS (essentially an "auto-winding" mode); I wanted to make enlargements up to 13" wide; my ideal weight for a camera body was 18 ounces; and I thought I needed a 35mm ƒ/2 and an 85mm ƒ/2 as basic lenses. Now, I've learned to appreciate up to 8 FPS (which the X-T1 has), although that seems profligate and I can't imagine needing more; I would like to make prints up to 17" wide, which is much bigger than 13" wide; ideal body weight is still the same, but now I think I need about five lenses including zooms, even though I have seldom owned that many lenses for one camera. And of course now I think I need IBIS, which has been thorn in my side, distorting my GAS, for a while now. There are also features we don't know we like until we try them (face-detect AF for instance) and things we used to take for granted that we don't get any more. any more, although it was nice and simple. As an example of the latter, I always thought I liked simplicity in cameras. My old Leica M6 had four global settings on it—you had to load (and later unload) the film, a finicky and always controversial process on a Leica rangefinder admittedly; mount a lens; install a battery for the meter—once a year, whether it needed it or not—and set the ISO. And it had six controls: shutter speed, aperture, focus, the film wind-on lever, and the shutter release. The sixth of the six controls, arguably superfluous and indeed something I never, ever used myself, not even once, was a little lever for previewing the framelines for lenses you didn't currently have attached to the camera. The point is just that I took it for granted at one time that cameras could be simple devices. You can't get simple digital cameras of good quality, of course. They don't exist. Every camera has dozens if not hundreds of settings and dozens if not hundreds of controls—and, often, dozens of custom configurations, too, which barely existed back in ye olden days. I like your "gunna" idea, because I've always suffered from a bad case of Gunna Disease myself. But I think sitting back and deciding what you actually need, in an abstract way, without reference to specific pieces of gear, helps keep it tamped down, at least somewhat. Kev: "I like your recognition of the new features that turn out to be rather good and you didn’t know you needed. This is the core bloody issue that drives GUNNA or GAS for me. E.g. : focus peaking—what a brilliant advance that makes so many things possible that were previously not. I have however always dismissed face-detection—maybe I should give it a try!" Mike replies: Have a look at this 2011 post by John K.
Peter Barker (Peterbee): "I've been meaning to make this comment once or twice before so here goes. Anyone can certainly make a list of features and performance levels and torment themselves with GAS fantasies or $3,000 blowouts—that is one way. But there is an alternative, and that is to ask yourself what you can do with what you've already got. Isn't that after all what OC/OL/OY is about? Isn't this a rather more creative approach? "The Japanese photographer Hiroh Kikai found himself in such a position when someone lent him the money to buy a Hasselblad in the early '70s. He knew he could never afford all the lenses and accessories to go with it, so he set out with the basic setup to see what he could do. The result was the wonderful Asakusa Portraits series which he is still adding to, half a century or so later. I'm going to say it: isn't that not so much an alternative approach as a better one in the second decade of the 21st century?" Mike replies: Ah, Hiroh Kikai. Ray Maines: "The only thing I can contribute to this conversation is that 3 FPS isn't enough. I don't know how many is enough or too many, but it's somewhere north of three." The simplicity/complexity difference is not as extreme as it looks. Those old "simple" cameras had dozens and dozens of film choices. The new cameras have the "film" built in, so those choices are built in as well. Mike: "I used to suggest, in the old days, that people sit down and write out a clean-sheet list of the features they want and what level of performance they think is sufficient. Then, they have that list to compare actual cameras to. The list should include "ideal" size and weight parameters so we can consider how close a camera comes to what we prefer, and also what lenses it has to have available for it." What you actually want to do is make a Pugh Matrix. This is a decision matrix developed by Stuart Pugh at Strathclyde University in Scotland to help engineers, scientists, and product development teams to evaluate features, functions, quality attributes and, if needed, business or marketing criteria against a "datum" (reference or "best in class" solution) in an effective, efficient, & reproducible way. Its also a simple and effective tool, and I used to use them all the time with my teams on Six Sigma, Design for Six Sigma and product development Voice of the Customer projects. They are simple and fast to do, and most importantly, they are objective and data-driven because they take personal biases and "agendas" (usually driven by execs who like to commit "executive arson") out of the equation. One of the many simple but effective tools that Six Sigma Black Belts have in their "toolkit". The other one is Mind Maps. The Leica was always my favorite camera, from the M3 I got in the mid 1960s, to the M7, that I later acquired. Next to "GUNNA" is "did it before will do it again" - this allows one to justify and be happy continuing to own Awesome Gear this year and going forward because one actually did Awesome Work with it. Two or three or whatever years ago. Once or twice. And never again. Of course, most of the camera market is about to be destroyed by people being cured of this affliction. Mike: The point is just that I took it for granted at one time that cameras could be simple devices. You can't get simple digital cameras of good quality, of course. They don't exist. Every camera has dozens if not hundreds of settings and dozens if not hundreds of controls—and, often, dozens of custom configurations, too, which barely existed back in ye olden days. I disagree, at least in part, and I think your Fuji X-T2 is a counterexample that demonstrates it is indeed possible to design a simple but highly configurable digital camera. To me, at least, the principal appeal of the Fuji product line is freedom from the tyranny of menus. The ‟mechanical” controls on the body of my X-T3 allow me to make the adjustments I typically need to make during a shooting session without delving into the menus, just like in ‟ye olden days.” Of course, I can’t completely ignore the menu items, but Fuji’s ‟quick menu” button gives me uncomplicated access to the few additional parameters I may need to set at the beginning of a session. I mostly navigate the main menu hierarchy only to adjust some esoteric setting—e.g., exposure or focus bracketing—and to format the memory cards. It’s possible to configure the physical controls on some other cameras, especially large, full-frame models with lots of buttons and dials, in a way that similarly reduces your dependence on the menus. But then you have to develop the muscle memory to remember which button or dial controls each function. You haven’t read about the Leica M-D, the screenless digital M with simple controls and no in-camera menus? The original Leica M Monochrom, which I bought used at 40% of retail, provides an experience reminiscent of my former film M’s, color lens filters and all (but, yes, it has a screen). My own variant of "gunna" is "you never know." As in, "You never know when you're gonna need XYZ." On nice bespoke wooden shelves in my garage are cardboard cartons, repurposed from their original use of shipping packs of copy and printing paper, and marked variously as, "plumbing", "electrical", and so on, plus one marked "GOK", "God Only Knows." From "plumbing" I know I can repair a faucet in the house we lived in 20 years ago. Do you think this is a form of insanity? My photography stuff is bedeviled by my own fantasies, of what kind of photographer I want to be. I'm coming to terms with the reality that, "I just take a bunch of pictures." "Gunna Disease" is part of the reason I don't understand the full-frame obsession that seems to be afflicting many in photography. Modern APS-C cameras (Sony, Fuji) are incredibly capable. They're also less expensive than FF equivalents. Very few people are maxing out their Fuji X-T2 or Sony a6500 capabilities. TI think the toothpaste is out of the tube. I read that the ILC market will shrink by 50% in the next few years. I suspect the companies, those that are still around, will become niche players. They will struggle to figure out what we "serious" photographers might actually spend money on in large enough quantity to make R&D for "new" features feasible. The probability that such a lovely "simple" camera as you describe will ever appear is low. As the graph gets lower, it will also get wider with fewer cameras being sold but a broader range of desired features. For example, I work mostly in the landscape, both the grand (mountains) and the non-grand (leaves, rocks and close trees). As such I barely need autofocus, let alone the myriad of other features my current camera has. Except when my grandsons appear at which point I cannot now live without eye-af, one of the greatest features...ever. I never shoot sports, action or "street,"... yet. I am a young 70+ and have no idea what genre might catch my fancy in my remaining years. So.. I'm a "gunna" of the first order. It would be nice if one could customize a camera for the features one currently needs and turn the others off but that too might be cumbersome. Great posts lately Mike. Excellent piece, Mike, I could not agree more. Although I'm happy to photograph and increasingly do photograph on old film cameras in B&W, I do use digital, mostly for colour. I am still waiting for the equivalent of my Olympus OM2n to turn up in digital. Sad to say, if it ever does, it will probably not have the Olympus name on it. "install a battery for the meter—once a year, whether it needed it or not—and set the ISO"
I never could wrap my mind around the idea of a Leica with a lightmeter*. Seems like it would just slow things down. Then again I was taught the the purpose of the rangefinder was to see if your estimation of the distance was close enough to not need to take the picture again. *well maybe a Gossen or a Sekonic nearby, but if you have to meter for every shot, maybe the Leica is not the tool for the job? I need great autofocus. I need great high iso image quality. 24mp is my current comfort range but this is a continually moving target. I need an option for about 8fps. I need the camera to have a silent option. Silence is something that I always wanted but now that it's available, I need it. I want the camera to be somewhere in the size range of SonyA7 up to a Nikon 850. I don't want smaller or larger. I want small 1.8 prime lenses. I want relatively small F4 zoom lenses. As a working professional photographer, everything else is either fluff to me or something that almost all cameras already have. BTW, regarding digital cameras that are "simple", the Leica digital M is still simple, and, as I understand it (not having actually used one), so is the Hasselblad X1D. Just judging from Canon's doomsday forcast for DSLR type cameras, it's not hard to imagine phone cameras replacing the advanced amature DSLR market too! Computational photography is where it's all happening! While I'll hold on to my 36MP Nikon for most of my professional work, I've found I'm using my 3-year-old 20MP phone camera more and more for picture situations I encounter, when I don't have the Nikon around. I've made 20x30" prints from both, and most people can't tell which camera was used for which shots. The newer phone cameras are even more amazing especially for low light situations. I have used the clean sheet of paper approach and bought a couple of cameras quite a while back that I still prefer over my more recent GAS attack purchases. Mostly it's the handling and ergonomics that have kept me happy. And I'd argue the older cameras have very appealing IQ. Remember the old microprism viewfinders on SLRs? That's something I took for granted that I don't think ever showed up on any DSLR. It was the "focus peaking" of the day. The comparable EVF feature always seems a bit fussy by comparison. I'd have to say I've left most of the features of my newer cameras untouched, but someday I'm gunna have to try those fancy scene mode settings! I have lots of wants, but after a lot of churn I've got a pretty clear list of what I need*, and it's not too crazy - Stabilisation is looming bigger, now - having it in camera really would be great, but if Fuji would make a stabilised 23 or 35 I'd likely shut up about that too. If you are learning or stretching yourself, your needs will likely expand, especially in a technology dependent hobby like this. The nice thing about actual needs is that they act as limiters as well as purchase accelerators - if you really find you 'need' a feature that isn't out there, well, nothing to buy! *Well, still want - it's not like this is a job, I just want to enjoy taking pictures and not fight my equipment to do so. There has been so much discussion on TOP the last couple years about such fine gradations between gear, that I wonder if you've at least a little lost sight of things. I don't mean to be critical, though obviously if I wasn't I wouldn't have written the first sentence. Aside from a few obvious outliers, most any genre of common photography can be competently shot and the photo competently printed to 11X17 with a five year old APC camera and one or two lenses, pick desired lengths. The infinitely fine distinctions between the faux rangefinders or faux SLRs from Fuji or Olympus or Panasonic and so on are just meaningless, aren't they, when you work backwards from a screen and even, I dare say, from a 11x17 print? Maybe I got jaded a bit, I used to enjoy the 2 year cycles of what will they come up with next, but I just couldn't see much of an improvement after a 16MP Sony chip in my Pentax K-5. And I work at a genre that likes fast AF, wastes a lot of shots and makes use of dynamic range. I did find as I switched back to film for almost 100% of my shooting that I didn't miss any of the newest tricks. I worked backwards on my requirements to find that I could get by just fine with the tech in the last of the film-era cameras. I'm not suggesting that everyone needs to go back in time. I am suggesting that if most photographers just used the last camera in their that they liked and forgot about gear until it up and died, their photography likely would not suffer one bit. I like to start at the end result I want to achieve and work backwards to the kit and spec I need to get that end result. Image quality wise anything from MFT and up is good enough for me but I do like "FF" for old film era lenses. Other than that I've recently been very impressed with face detect which has made me lust after something with eye detect. There is in my opinion one very simple digital camera and that is the Leica MD. 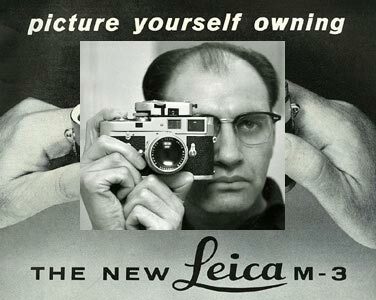 It pretty much has the same a Leica M6 has. It’s my camera of choice. Same very focused and simpl analogue experience but recording the image on silicon. I doubt that I will ever change this camera. I keep on finding things--features--in my cameras I didn't know I would ever use. But I sometimes do. Who'd a-thunk it! But if I didn't have those features, I don't think I would miss them. It's kinda like drug addiction. You use it and it's nice but you don't really need it. Until you do. Simple, good digital cameras do exist. You just get any camera and leave it on its factory default settings. Throw it into P mode and you're good to go. My wife does this with a pair of OMD E-M10 Mark IIs (considered grotesquely complex and over configurable by many) and simply captures what pleases her. I'm not going to mention the HTC M10 camera, because it lives in a phone - but I've yet to see its equal as a pocket camera. I often find I'm buying more camera than I want or need just to get that ONE feature I want that's not available on lower-end models. Gunna use manual focus more. Been waiting until cameras offer it again (mirrorless cameras with various aides). Still waiting to do it even with 6 years of mirrorless behind me. Leica M's are still simple, especially since they removed the video function. They don't have eye focus (on their own) built in, though. "You can't get simple digital cameras of good quality, of course. They don't exist"
For most of my photography (landscapes, travel, family, documentary), I really only need the basic settings that you mention. I have come to appreciate image stabilization, and sometimes face detection. True that there are many settings in my cameras that I don't even bother to try, I don't need them. True also that we often make things complicated for ourselves, getting fascinated with all the menu options. Gunna Disease - can we have this officially registered in the medical journals? It seems to adequately explain, well, some of us and our common condition. 2nd part - I actually blame you and your fine observations for hopefully being cured of GUNNA. Yes. It's true. One day you posted something about making decent black and white photos in digital. I followed your instructions, thought about things, and looked forward to the day I could afford a used Sony A7 that you recommended. If ever there was a clear case of GUNNA this was it. Prior to that I spent years acquiring Nikon manual focus lenses. The GUNNA was to shoot video with my then new Canon 5D MkII. Except, I never shot a thing with that combo. The disease lingered so long that it outlasted the Canon DSLR gear which was later shoveled out of the closet to make way for other, smaller, lighter gear. I'm now heavily invested in Sony APS-C mirrorless (too many NEX5T, an A5000, an A6000, and more on the way). This is why I really "connected" with your Sony A7 recommendation for black and white digital work. I was GUNNA make some great black and white. In the meantime, I felt I really should explore black and white photography with what I have and perhaps marry the project to finally pressing into use the old Nikkors (of which there are now far too many - who can pass up a good condition 10Euro 50mm f/2 AiS? - not me!). I am liking the results. Your instructions and comments have completely changed my experience of digital black and white. It reminds me so much of when I shot large and ultra-large format film, but now with more predictable, consistent results. Recently I went over to that sensor rating site just to confirm how many stops the APS-C Sony sensors had verses the A7 full frame. Huh. Would you look at that? 13.1 EV for the APS-C vs 13.5 EV for the full frame. OK, then. No need for that A7, now is there? Your point about thinking you liked simplicity is interesting. Because I didn't know I liked simplicity until I started using digital cameras. But I've now got to the point where the thought of yet another piece of gratuitous complexity makes me feel physically unwell. So I am the precise opposite: when all I had was simple cameras I thought I wanted complicated ones, while now I yearn for simpler ones (and indeed mostly use simple ones). If one conflates the darkroom, film camera, and lens filtration together; then you would have about the same number of options/complexity as a digital camera and a WiFi printer. In the old-world you had a separate machine for different steps of the process, now in the new computer controlled world one machine can do many processes. One can see this difference in various machine-shops around the world manual-lathe vs a CNC lathe. Most of my purchasing regrets come from GUNNA disease (more so than GAS). I've rarely regretted buying something better than I needed. But I've regretted buying things to do something I was gunna do. For instance, in my basement workshop, I have a few tools that are a little bit overkill, but that makes me like them that much more. OTOH, I've purchased specialty items - usually because I saw a good deal - for things that I've never gotten around to doing. Kind of like buying filters or adapters or gizmos or gadgets (or lighting stands, studio strobes, and backdrop) for photography that I was gunna do. Over time, I've learned to wait for a real need (or a real want !) but try to avoid buying for an anticipated need. But I'll admit I'm still hung up on the "maybe gunna print big one day". Sorry Mike, I think you missed it. The M6 is a 'camera', not a 'photographic device'. Just the same as an atomic bomb is a BOMB! Not a 'nuclear device'. And yes, I know that a dark room with a little hole in one wall is also a 'camera'. I still have an irrational repulsion for calling all sorts of things a device. Was it 2012? I was still using Velvia slide film and scanning it at 24MP, so the D800 finally looked like a reason to go to DSLR. Then Kodak discontinued the home color chemicals... I took the hint. So now I can do what I used to but more easily and I also have added capabilities. The damn thing sees in the dark! I no longer have as much free cash (bought more lenses - love the new 20mm) but I feel no pressure to upgrade. I always try to buy the best tool that I can afford - I will use it up after many years. I haven't checked how many images we've made, but probably over 10,000. That would be a lot of Velvia. In short: The D800 is still my favorite toy. $3000 isn't that much IF you are going to get what you want for a long time. Yup, I'm gonna sound like a luddite but if what you want to do is make 17" prints, then my experience is that 6 megapixels is probably plenty. Jim in Kansas. GUNNA has another feature, perhaps a correlation: the would-be photographer is GUNNA take more photos, or take a different kind of photos, once he gets a new piece of equipment. This acts as a double justification: I'm not GUNNA do something difficult (take photos) and I am GUNNA buy something new that I want. Insidious. You can't get simple digital cameras of good quality, of course. Sure you can...the Fujifilm X100F is about as simple as it gets. Sure, there are menus and stuff, but you don't need to use any that stuff to actually operate the camera, just the same basic physical controls on your Leica M6.